The Reign Of Edmond Heatley…Yes, Dark Days Ahead In Clayton County…The Most Despised Superintendent? | Georgia Teachers Speak Out! ← What Was the Cobb County School Board Thinking…Hiring Michael Hinojosa? What’s Wrong With Going Local? The Reign Of Edmond Heatley…Yes, Dark Days Ahead In Clayton County…The Most Despised Superintendent? I have been around the block a few times in Clayton County when it comes to politics generally and school politics specifically. I have never seen a superintendent in Clayton County who is so apparently despised by the employees of the school system as Edmond Heatley is. I lived in Clayton County for 27 years, and during these years, I was intimately involved in the struggles over who would be the superintendent of the schools there. It was indeed always a struggle…because, besides Delta Airlines, the Clayton County School System was the big employer in the county. Clayton County was always considered a “red” county in the sense that it never pretended to be a “blue-blooded” county. (Well, I take that back…some blue-blooded wannabes on Lake Spivey did try to have that air about them but we all knew that they were just one generation from Forest Park or Mountainview blue collar…which is O. K.) No real country clubs. No YMCAs. No real museums (the “Gone With The Wind” museum in the old train depot notwithstanding). Just a working stiff county of good, red-blooded Americans who took their politics very seriously. Politics in Clayton County was indeed a “blood sport.” Ha! For years, Ed Edmonds was the feisty superintendent of Clayton County. He was short and bounced around like a bantam rooster. No one ever doubted who was in control…when Ed Edmonds was at the helm. Ironically, I believe that I recall that Mr. Edmonds originally hailed from the state of Kansas. Back when Mr. Edmonds first took the helm of the schools, there was Jonesboro High and then Forest Park, the two huge rivals. The location of the old Flat Rock High School (which is now covered by one of the new runways at Harstfield-Jackson International Airport at I-285 in northwest Clayton County) eventually became North Clayton High School. Depending on his popularity at the time, I understand that the Clayton County legislative delegation would have the superintendency in Clayton County bouncing back and forth from appointed by the school board to elected by the people. One old-timer told me that Mr. Edmonds might show up at a school faculty meeting and chew out everyone with spicy language, but after the meeting he would laugh and guffaw and hug the teachers. He was one of a kind. One of my best friends grew up in a house next door to the Edmonds‘s house on East Fayetteville Road in Jonesboro (up the street from the back entrance to what is now the Eula Ponds Perry Center). Mr. Ernest Stroud was brought over from the West Georgia area by Mr. Edmonds to be the principal of Forest Park High School in its heyday. I believe that Mr. Stroud arrived in Forest Park in 1958, only two years after Forest Park High School had won the State Championship in football, tearing up Randolph County in the State Finals in Cuthbert, Georgia. (The division was Single A but back then Georgia had Divisions B and C as well.) J. Charley Griswell, who later became the Clayton County political lion for the better half of four decades, was the star halfback on this championship team. Coach Wally Butts of the University of Georgia signed Griswell to a full scholarship. (I might add that the two most glorious football players at Forest Park High have been J. Charley Griswell and Hines Ward.) Many eventual politicians like long-time State Representative Jimmy Benefield attended Forest Park in it glory years. Stroud didn’t stay there long…probably because Edmonds saw a diamond in the rough…or, better yet, didn’t want Stroud to end up being his political rival. So, Edmonds brought Stroud to the County Office to be his deputy. Emmett Lee took Mr. Stroud‘s place as principal of Forest Park High. Eventually he came one of Mr. Stroud‘s two Assistant Superintendents. The other one was Dr. Clifford (Cliff) England, who had been principal of North Clayton High School. Until Dr. Joe Lovin took office as Superintendent in January of 1987, Clayton County only had two Assistant Superintendents, and the county ran like a top, with the children actually behaving in the classroom, by and large. When Mr. Edmonds retired, Mr. Stroud ran for superintendent and was elected superintendent in Clayton County in 1970, 1974, 1978, and 1982. Mr. Stroud ruled Clayton County with an iron grip. Like Mr. Edmonds (his mentor), you never doubted who was in control. But, there was never the nasty animus toward him…like the kind that we hear about directed toward Heatley. Now Stroud had his detractors, but his principals generally adored him. But, they too were “his” people. Very few, if any, women in the early years. Only M. D. Robert, principal of the old Fountain High School, if I recall correctly, remained as an African American principal during the early days of integration. (There had been another African American principal when M. D. Roberts was principal at Fountain High before desegregation. I believe her name was Mrs. Velma Smith — again, if I recall correctly. After desegregation, the Jonesboro Colored Elementary School — yes, the actual name — was closed. Now, it is the “White Annex” on Lee Street.) But, Clayton’s African American population was 3.5% during the 1970 Census. Eddie White was Assistant Principal at Babb Jr. High in the old days. He was the lone African American administrator when I arrived in Clayton County in 1982. (After Dr. Bob Livingston was elected to superintendent, he promoted Mr. White to Assistant Superintendent of Human Resources in 1991.) Mr. Henry Garner, an African American who had administrative credentials, was never given an administrative position during the Stroud Era. It wasn’t until Dr. Joe Lovin was elected in 1986 that Mr. Garner was given an administrative job within the system. Stroud chose not to run again in the 1986 election. His top associate at the Central Office was Pete McQueen, a gregarious glad-hander who was considered to be a very effective principal at Morrow Jr. High School before he was brought to the Central Office to be Stroud‘s “kinder and gentler” assistant. Pete could get along with just about anyone and was most gracious in his interactions with people. But, his close association with the Stroud Regime is probably what cost him the election in 1986. He garnered 46% of the vote to Republican Joe Lovin’s 54%. I suggested to Joe Lovin that he use “…for the children” on all of his signs, bumper stickers, and literature. He did. McQueen was still using the old hand-painted large plywood signs…with no motivational logo or slogan. Lovin even put “…for the children” on the masthead of his stationary once he took office. Lovin brought in a lot of his guys (mainly from principalships in the county). But, when he reached out to Gwinnett County and brought in two Central Office guys and one principal for Jonesboro Middle School, this was a little more than the local folk could take. Plus, Joe Lovin was seen as a superintendent “soft” on discipline. These factors did him in. He lost in his own GOP Primary to John Williams, a former Director of Transportation in Clayton County who had had several run-ins with Dr. Lovin. In the Fall of 1989 at a Jonesboro High-Forest Park High football game at Tara Stadium, Dr. Bob Livingston, the long-time principal at Mundy’s Mill Middle (formerly Jr. High) School at the time, told me that he intended to run against Joe Lovin the next year for superintendent. He asked me if I would help him. I committed to do so. (I too was disappointed with Dr. Lovin at that point.) The powers-that-were in the county at the time were not behind Dr. Livingston‘s efforts. They apparently went to Wilt Marchman who was the principal at Kemp Elementary, encouraging him to run. Marchman eventually backed Livingston, as Livingston‘s campaign began to groundswell. Livingston handedly defeated Deputy Superintendent Dr. Cliff England and Fulton administrator Dr. Marvin Reddish in the Democratic Primary, with no run-off necessary. Livingston went on to defeat John Williams in the General Election, garnering more votes than any other politician besides Ronald Reagan in the history of Clayton County. I focused on Dr. Livingston’s image, writing some script and designing his logo and creating his slogan, beautiful if I may say so myself. Dr. Livingston told me that one lady told him, “I voted for you just because of your signs.” They were indeed beautiful. A special red. A special yellow. PMS colors, as I always used. Special typeface. Beautiful and aggressive brushstroke underneath the name. The slogan? Because Leadership Matters. If may be so vain (and y’all know that I am – Ha!)…Dr. Livingston told me that one particular elected judge told him to “stick with Trotter — he’s a political genius.” Ha! Do you think that I would write this if it were not true…especially with Bob and Bernice still living in Lake Spivey? One thing that I will always say about Bob (besides being a good administrator) is that he is honest. Honest to the core. I could go on and tell you all of the details about how Dr. Joe Hairston became the first appointed superintendent of Clayton County under the provisions of the new Georgia Constitutional Amendment. I could tell you the gory details of how we got rid of him. He, like virtually all “national” superintendents, was arrogant and very unpopular in Clayton County. Then a came Dan Colwell. Dan was a popular local choice, and Mike Barnes, Mark Armstrong, and I cut the deal at Riverdale Radiator that got rid of Hairston and put Colwell in his place. (Some folks whom I had recruited and had helped get elected at that point were totally dissatisfied with Hairston and wanted him gone, even though qualifying for elections was only four months off. Hairston left in January of 2000, and Colwell was appointed that same night as Interim Superintendent. The same ones on the school board who made it possible for Colwell to be superintendent became disenchanted with him when he treated them brusquely in public. I witnessed Colwell‘s inexplicable treatment of these school board members. After the 2002 election, three new board members arrived (two incumbents had been defeated). In January of 2003, Nedra Ware and Gang cut Colwell with the dull edge in public, which proved to be a big mistake. Ware handled this situation very poorly, and the whole episode became a cauldron in the media. Naturally, I was blamed for everything. Ha! Against my advice, Nedra Ware and Gang hired Dr. William Chavis as the Interim Superintendent. After Pulliam came three straight Interim Superintendents…Dr. Gloria Duncan, Dr. Valya Lee, and the inexplicable one, Dr. John Thompson, another of these “national” supes who too was extremely unpopular. Finally, in the Spring of 2009, the Clayton County brought in a person who by all indications was unpopular where he was stationed at the time, Chino Valley, California. Why? Who knows? Dr. Sam King was ready to come “home,” if the Clayton County Board of Education had only asked him to come. I know because he told me so. No, Alieka Anderson and Pam Adamson led the way to bring in Edmond Healtey who, in my opinion, has been the most unpopular and despised superintendent in the history of the Clayton County Schools. He and his apparent Kappa Alpha Psi sidekick, Douglas Hendrix in Human Resources, have been the apparent source of much frustration and angst on the part of the school system employees. I know that Edmond Heatley and Douglas (Doug) Hendrix refuse to process the grievances as mandated by O.C.G.A. 20-2-989.5 et seq. 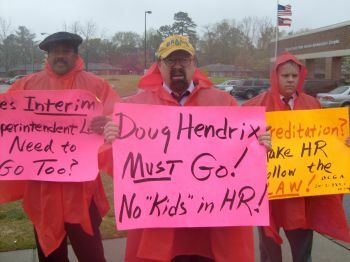 In fact, we picketed Doug Hendrix in the rain before Edmond Heatley ever arrived in Clayton County. Now Heatley is calling upon the Clayton community to support the schools. He held a news conference a couple of days ago, and in this conference, he even referenced rumors about his resigning from the superintendency. The “comments” after the article in the Clayton News/Daily about his news conference were overwhelmingly negative comments about Heatley. Such a news conference will not solve Heatley‘s problems or change the feelings on the ground in Clayton County. I suggest that if Heatley wants to turn around his vast unpopularity in Clayton County, he needs to start in Human Resources. He needs to process employee grievances according to Georgia law. He needs to quit inordinately installing folks from California and Kappa Alpha Psi into the administrative positions. Teachers are howling for change. I have personally talked to enough of them to know that it’s reaching a boiling point. I have personally known and interacted with a bunch of superintendents in Clayton County (Stroud, Lovin, Livingston, Colwell, Chavis, Pulliam, Duncan, and Lee). I only met Hairston (I never even wanted sit down with him), and I encountered Heatley just once when I confronted him at a school board meeting about violating the State‘s grievance law. I never even met John Thompson. He was here and gone in a lickety split. I have seen them come and go. Unless Heatley drastically changes his ways, he is on his way out. He may not know it yet, but his professional tenure in Clayton County will come to a screeching halt. I have always said that Clayton County is “graveyard for superintendents.” When have you ever known one to willingly and graciously leave on his or her own? I haven’t known one. Stroud didn’t run in 1986 but most everyone knew that his days were numbered, although he was considered by many in Georgia to be the State‘s strongest superintendent. One fellow who ended up in the Deputy Superintendent’s seat in Clayton County, reminisced: “Trotter, we all thought you were crazy in the old days when you took on Mr. Stroud!” I am still “crazy.” In addition to Mr. Stroud, I have personally watched nine more Clayton County superintendents come and go. I am still “crazy,” and I’m still around. Just an afterthought…If Edmond Heatley had to run in a Democratic Primary (or Republican — but this party is virtually dead locally in Clayton County), I don’t think that he could scratch 30% of the vote. He is just that unpopular in Clayton County. My slogan options? “Promote the Children & Demote the Sarge!” “Save our Schools & Bust the Sarge!” “Stop the Clayton Gold Rush! Send the Californians Packing!” “Let’s Go Clayco! Bye, Bye Malibu!” “Say Nope to Nupe! Bye, Bye Kappa Alpha Psi!” I better stop, heh? Gotta to go eat anyway! 16 Responses to The Reign Of Edmond Heatley…Yes, Dark Days Ahead In Clayton County…The Most Despised Superintendent? dr trotter – please keep it up> i retired recently in clayton> i daily hear the stories about heatley’s antics >>> something needs to be done about doug hendrix too!!! please keep writing!!!!! The best thing for Dr. Heatley to do is MOOOOOOOOOOOOOOVE on. He has mainly brought frustration and dictatorship to CCPS. And most of the Board of Education members should move along with him (excluding Jessie Goree and Trinia Garrett). You would think a man with only 2 years of classroom experience should have never been appointed to a superintendent position anyway! Yes, just two years as a classroom educator. What was the school board thinking? (Same thing in Cobb County…what was that school board thinking?) I have personally known Jessie Goree for about 15 years. She will make some noise…and for a good cause. For the record, as a teacher, Ms. Goree never joined MACE, but I have always appreciated her spunky spirit…and her willingness to stand up for the children, despite going against the grain. I have never met or communicated via phone, email, text, etc., with Ms. Garrett. I don’t know her personally (although some have fallaciously claimed that she is a MACE member — but I don’t even think that she teaches). I also appreciate her standing up for what is right. These ladies aren’t perfect, but who is? Standing up against bullies of all stripes is important in life. Going along just to get along is for cowards. Great history of Clayton County!!!! I remember you well, Richard. I hope that life is treating you very well in your retirement — if you are now retired! Take care, John. YES! Edmond Heatley is the worst superintendent in history of Clayton county! Doug Hendrix must go too! Heatley was loathed in Chino Valley Unified School District in California and after cutting jobs and closing school in low income areas no less, he suddenly was hired in Clayton and disappeared along with his USC protoges. Sorry guys. He was replaced by the best, most experienced man our district had to offer and I hope the same for you. Mr. Mahmoud: Edmond Heatley certainly would not win a popularity contest here! Ha! In fact, he makes a good case for elected superintendents! You are either a member of the teachers’ union or quite possibly the single most uninformed community member in the school district. Heatley’s replacement is a puppet for the school board and unions (much like Trotter wishes for). Heatley’s 2 failures were 1) not recognizing that closing schools would allow a charter school to move into one of them, and 2) underestimating how hard the unions would fight to maintain the status quo in the face of improving the quality of education for our kids. We were fortunate to have Dr. Heatley here for the brief time we did and I only hope we can eventually revoer from the impact of his replacement. Dear Chino Parent: All I know that in my close observation of the Clayton County Schools here in Georgia, Heatley appears to be the most unpopular superintendent ever. I suspect that from what all I have read that he was just as unpopular in Chino Valley, California. But, perhaps you are one of his acolytes. Ha! Thanks for reading and thanks for writing. Mr. Heatley is not qualified to be a superintendent of anything. Chino Valley Unified School District in California still suffers from his decisions that were never based on research of any kind (or he simply did not bother to read the research in the first place). I feel sorry for Clayton County, and I am deeply afraid of any district who decides to employ him without thoroughly checking his record. Hurricane Heatley’s record speaks for itself. I like this name…Hurricane Heatley…because he sure seems to do a lot of damage in a school system! Ha! I just call him Sgt. Heatley. He only taught school for two years. We certainly don’t want him back in Chino Valley; or anywhere near California for that matter. As a laid off teacher, and thus casualty of his dicatatorship, I can tell you, he had no compassion for the those of us he laid off or for our children, many of who attended schools in the district. He had no empathy for the low income families in our communities who had local schools closed down and are still forced to walk to other neighborhoods to receive an education. He blew into Chino Valley, created chaos in our lives, and was then gone without even a whisper. “Hurricane Heatley” is an insult to the hurricane. At least a random act of nature doesn’t deliberately cause so much pain! Helen: To put it very mildly, Edmond Heatley is probably the most unpopular superintendent that Clayton County has ever had, and I have closely followed Clayton County school politics for nearly 30 years. Obviously from the poor performance and loss of education in a county the teachers need someone on thier behinds. Low Low Low performance. Big pay! Not caring what happens to the students. They need a hellion over them. @ thedove: You are assuming that the fault lies with the teachers, as do most of these superintendent clowns. Blindly and myopically blaming the teachers for the students’ failures is both ignorant and erroneous. Teachers can teach but they cannot learn. Physicians can treat but they cannot heal. Lawyers can defend but they cannot acquit. The motivation to learn is a social phenomenon, and many of the students come from families which apparently do not cherish and value learning. They bring little motivation to school to learn. If a dentist treats a patient who persists in not brushing his or her teeth, then are you going to blame the dentist for the patient’s rotten teeth? The patient has responsibilites just as do the students. The teachers facilitate but the onus for learning lies with the students and their parents. Educational nuts like Edmond Heatley and Romain Dallemand are examples of how far educational leadership has sunk in this country.